The economics of countries in the Indian Ocean region are rapidly growing. The countries in the Indian Ocean region host a wide variety of races, cultures, and religions. The strait of Hormuz is one of the world’s most strategically important choke points. The sugar industry has employed various tactics to influence health policy in its favour. Tonight’s ABC Four Corners program investigates the influence of the sugar industry on global policy efforts to curtail the rise of obesity. This includes the industry’s involvement in thwarting implementation of a sugar tax, and in watering down Australia’s now largely ineffective health star rating system. Called Tipping the Scales, the program will highlight some of the tactics the industry employs. The ABC reports companies such as Coca-Cola, Pepsico, Unilever, Nestle and Kelloggs “have a seat at the table setting the policies that shape consumption of their own sugar-laced products”. The reality is that industry is, by and large, making most of the policy. Public health is brought in so that we can have the least worse solution. The Conversation’s experts in health policy and economics have weighed into this debate over the years. Here’s our pick of five analysis pieces that will get you informed before tonight’s program. The sugar industry hasn’t only had its finger in the policy pie, it has also pulled some strings behind the scenes of scientific research into sugar’s health effects. A study published in the Journal of the American Medical Association in November 2016 revealed that, in the 1960s, the sugar industry paid scientists at Harvard University to minimise the link between sugar and heart disease. The paper’s authors suggested the sugar industry may largely have shaped many of today’s dietary recommendations. And some experts have since questioned whether such misinformation may have led to today’s obesity crisis. The sugar industry has influenced research in the past. A 2007 paper that compared over 500 studies found those funded by pharmaceutical companies were half as likely to report negative effects of corticosteroid drugs (used to treat allergies and asthma) as those not funded by pharmaceutical companies. The ABC’s Four Corners team interviews the Obesity Policy Coalition’s executive manager, Jane Martin, who is frustrated that industry lobbying has scuttled efforts to make the health star system mandatory. The health star rating system was introduced in June 2014. It’s a front-of-pack labelling system that rates the nutritional profile of packaged food and assigns it a rating from ½ a star to 5 stars. The more stars, the healthier the choice. While manufacturers might be happy to display stars on foods that attract between two and five stars, they are less likely to put one or half a star on their products. Since Mexico introduced a sugar tax in 2014, nearly 30 countries have gone on to do the same. Last month the UK introduced a levy that manufacturers must pay for their high-sugar products. More than 20 countries have taxed sugary drinks. Companies will have to pay 18 pence per litre on drinks with more than 5g of sugar per 100g. Drinks with more than 8g per 100ml will face a tax rate equivalent to 24p per litre. But the ABC reports efforts to introduce such a policy in Australia have failed, due to the lobbying efforts of the Beverages Council. The evidence for sugar’s negative effects on our health is well known. A study published in the journal PLOS ONE in April 2016 showed a tax on sugary drinks in Australia would prevent 4,000 heart attacks and 1,100 strokes. The researchers examined the potential impact of a 20% rise in the prices of sugar-sweetened carbonated soft drinks and flavoured mineral waters on health, healthcare expenditure and revenue. The UK’s Treasury is estimating the sugar tax will raise £240 million per year. Modelling done in Australia by the Grattan Institute shows that a tax of 40 cents per 100 grams of sugar could raise about A$400-$500 million per year. A sugar-sweetened beverages tax will reduce domestic demand for Australian sugar by around 50,000 tonnes, which is only about 1% of all the sugar produced in Australia. And, while there may be some transition costs, this sugar could instead be sold overseas (as 80% of Australia’s sugar production already is). 5. How bad is sugar, really? And finally, if you’re wondering how much sugar you can eat to stay healthy, here’s an article written by Flinders University nutrition lecturers Kacie Dickinson and Louise Matwiejczyk that explains exactly that. If you’re an average-sized adult eating and drinking enough to maintain a healthy body weight (roughly 8,700 kilojoules per day), 10% of your total energy intake from free sugar roughly translates to no more than 54 grams, or around 12 teaspoons, per day. A 600ml bottle of Coke contains more than 14 teaspoons of sugar. Health Check: how much sugar is it OK to eat? The conflict in Syria has left more than 6 million people internally displaced. The latest military strikes by the US, France and Britain in Syria highlight the Trump administration’s uncertainty on its role in the conflict. With a near triumphant Syrian President Bashar al-Assad firmly under the control of Moscow and Tehran, the strikes against military bases suspected of facilitating the chemical weapons attacks will be nothing more than a footnote in the wider battle for influence in the region. Trump must look towards the future and focus on influencing the reconstruction of Syria. Without an active United States, Turkey, Iran and Russia will push international aid agencies and influential Western donor governments onto the sidelines. Instead, they will take the lead in rebuilding Syria in their images, an outcome that will hurt the Syrian people and further destabilise the region. It is hard to find parallels in history with the extent of destruction in Syria. Not since Dresden has devastation been so extensive. The four-year siege of Sarajevo, where regular bombardment from the surrounding mountains ravaged the city and reduced many areas to rubble, is a comparable yardstick repeated across Syria in Damascus, Aleppo, Idlib, Homs and Hama. And then there is the human cost. More than 6 million people are internally displaced. Another 5 million are living as refugees. Each person fled a home, a job and a community that will have to be re-established. This won’t be easy, given those who have migrated to Europe are estimated to represent between one-third and one-half of all Syrians with university-level education. Even if it is theoretically possible to overcome these challenges, the most basic level of reconstruction has been estimated at US$100 billion, and possibly as high as US$350 billion. This far exceeds the estimated US$60 billion reconstruction cost of rebuilding Iraq after the 2003 invasion. Some reconstruction experts have advocated sidelining Assad’s Syria, and only providing support to rump areas under the control of US allies. NGOs are advocating conditioning international support on a political solution being agreed, respect for human rights, and protection of an independent civil society. The Western-led international aid community faces a conundrum as it sits on the sidelines watching others prepare for the post-conflict reconstruction. Should the international aid community adapt and compromise or stand firm with their demands and principles? Without the West driving the development agenda, Syrian authorities will eschew aid focused on human rights, gender equality, market liberalisation, and democracy. They will have little patience for the Western allegory of aid as salvation, in which the original sin of colonialism drives an effort to save people from poverty by recreating their societies in our image. Instead, akin to Chinese aid to African countries, major infrastructure projects that serve government interests will top the agenda at the expense of assistance to the other pillars of successful modern countries. These projects will be funded, managed and implemented on a quid-pro-quo basis. Syrian elites and foreign governments will secure most of the benefits. For an aid industry weaned on Western donors and their gender mainstreaming, community consultation, and pro-poor development, adjusting to taking direction from a Syrian government dismissive of the Western conscience and liberal democratic values will pose a substantial challenge. It will lead to serious ethical questions being asked. aid agencies can contribute to sustainable development if they are prevented from strengthening civil society. There is no right answer to these questions. Some will take the pragmatic path; others, the high road. For many aid workers – particularly those associated with advocacy NGOs – staying true to their worldview will mean being sidelined. They will be forced to operate in neighbouring countries, as Syrian authorities refuse to tolerate what they will perceive as social engineering disguised as humanitarian assistance. This will leave UN agencies flying the flag of the development consensus in word only; they will be bereft of many of their implementing partners. Without these partners, they too will have to reconsider their modus operandi: partner with local sectarian NGOs with questionable affiliations, or undertake more direct implementation. Under these circumstances, new approaches to implementing humanitarian and development programs will be need to be sought. One opportunity is to harness Syria’s rich tradition of religious institutions playing a leading role in society. But even such a pivot will pose a conundrum: engaging with these groups will require the international aid community to reconsider its secular agenda. How the international aid community responds to these challenges will shape outcomes not only in Syria but for future humanitarian crises. Trying to force the Western development agenda onto Syrians will be counterproductive, leading to the strengthening of non-Western aid organisations that operate outside the decades-old development consensus. With new-found experience and cashed-up from the largest reconstruction effort since the second world war, these agencies will begin to set the agenda not only for Syria, but in other countries whose leadership will prefer respectful collaboration over what’s seen as Western condescension. Alternatively, Western aid organisations can acknowledge this emerging dynamic and find ways to work with the regime, its sponsors in Russia and Turkey, and the young, emerging aid organisations. This will require compromising some of the ideals that have been at the heart of the sector and adopting new ways of working. But doing so will lead in the long run to a wider buy-in to the development consensus by the next generation of global aid actors. 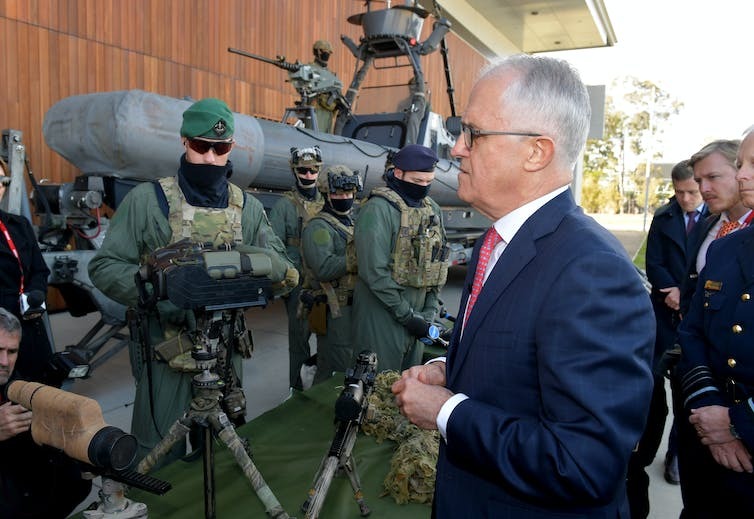 Malcolm Turnbull announced the proposed changes in front of heavily armed special forces soldiers. The government’s announcement of plans to strengthen the Australian Defence Force’s (ADF) role in domestic counter-terrorism operations appears to be a quick and decisive reaction to the New South Wales coroner’s report on the Lindt Café siege in 2014. The proposed changes may help to clarify some of the confusion surrounding the role of state police and the ADF in responding to terror attacks. However, to prove effective in practice, the changes will depend heavily on the willingness of state police to accept military advice and assistance. The major change proposed is to relax the call-out powers for ADF assistance during a terrorist attack. Prime Minister Malcolm Turnbull described the existing law as “cumbersome” – and it certainly sets a high bar for requesting military involvement. the state “is not, or is unlikely to be, able to protect itself”. This is consistent with the Constitution, which allows the Commonwealth to protect states against internal violence “on the application of the executive government of the state”. A formal request for ADF assistance was not made during the Sydney siege. Despite the many recognised problems with its response, the NSW police force did not believe its capacity to respond to a single armed offender was inadequate. Details of the proposed changes have not yet been released. But it appears that state governments will be able to request “specialist” or “niche” assistance from the ADF. For example, they may request assistance with specific weaponry such as sniper rifles or other high-powered weapons. This will provide more flexible arrangements for state governments to request ADF involvement. Rather than admitting that its overall capacity to respond to a terrorist incident is inadequate, a state government could request assistance on more specific grounds. However, it appears the process will still require state governments to request assistance from the Commonwealth. Whether state police forces will concede that their ability to respond to terrorism is inadequate – even on more specific grounds – remains to be seen. It also appears that requests for ADF involvement will depend on whether state police classify an incident as an act of terrorism. This in itself is open to interpretation, and may prove difficult to determine in practice. Another proposed change is to embed military liaison officers within state counter-terrorism police units. This will help build a closer relationship between the ADF and state police forces – if they can work together well. During the Sydney siege, ADF liaison officers attended the police forward command post. In his report, the NSW coroner noted that the role of these officers was poorly understood, and that NSW police could have drawn on their expertise to a greater extent. Controversy remains over whether police failed to heed military advice that their bullets would fragment on hard-tiled surfaces. 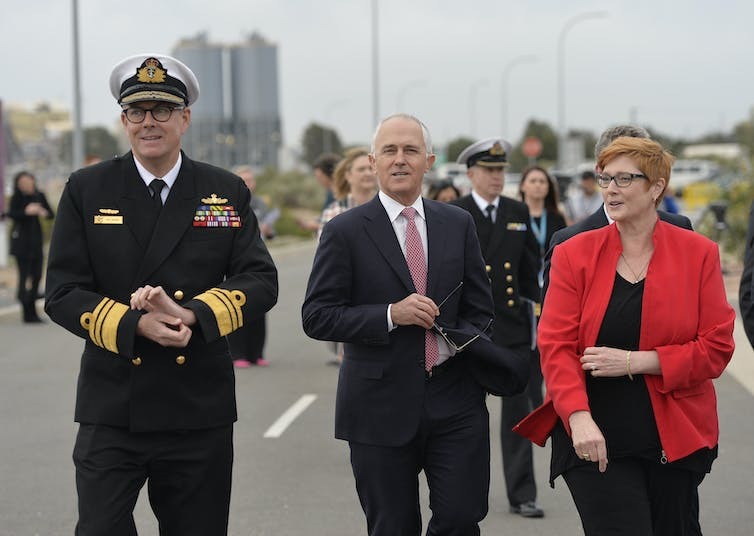 Formalising military liaison positions will help clarify the ADF’s role in circumstances that fall short of a formal call-out. However, it seems the key problem to date has not been an absence of military advice, but a lack of willingness to accept it. A third major change is for special forces soldiers to provide enhanced training to state counter-terrorism police. This is likely to be the most effective strategy for improving operational responses to terrorism. The ADF has two tactical assault groups – East and West – based in Sydney and Perth respectively. Realistically, these specialist units could only respond to a terrorist attack in one of those cities, or in the event of an extended siege. Having specially trained state police is crucial if first responders are to deal adequately with the threat of terrorism. Improved training procedures will enable state police to draw on the expertise of Australia’s special forces, while avoiding territorial issues as to who should have jurisdiction in the event of an attack. They also avoid difficult constitutional and democratic issues regarding the expanding role of the military in domestic crime control. Seeing Turnbull flanked with soldiers in gas masks, as well as soldiers patrolling the streets of Paris and London, should urge caution against an expanding role for the military in public life. The link below is to an article reporting on the punishment that a Lebanese man will receive for his role in a conversion of an Islamic woman to Christianity.